London is BIG! Although it might look quaint and charming on the postcards, there is no getting away from the fact that this is a massive city. Saying that you live here is a little like saying that you live in New York. There is a huge difference between living in Manhattan and living in Queens. If you have recently moved to London or are about to move to London then you might want to take a look at the city from an area by area basis to try to learn more about the way that London is structured and where you might want to live based on your preferences. From urban jungle to suburban green belt, London has it all. There are many suburbs in London that have been made famous by the many films that have been made in and about London, so it might be wise to start with some of the better known places. Everyone remembers the leafy verdant park and the quaint English bookstore where Hugh Grant and Julia Roberts fell in love, but what is it like to live in Notting Hill which is one of the trendiest areas. Firstly, you’re going to have to fork out quite a lot of money for the privilege of living in this suburb, not only is it trendy, but it is one of the most expensive suburbs. One of the joys of living in the area though is that the suburb has retained its village atmosphere as well as its artistic charm and market style. 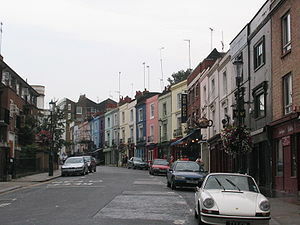 It is a community of people, many of whom are artists and the suburb of Notting Hill stretches from Kensington all the way to Holland Park. It has always been a bubbly artistic community, but since it was poularised in the film of the same name, it has become a prime real estate location for the upwardly mobile. Famous for the Portobello Market, where you can find absolutely everything and anything, from the cute to the truly bizarre. The homes in this suburb are larger than normal, although many of them have been divided and renovated so that they are now small flats and apartments. With prices for homes that range upwards of £2000 you might wonder if it is worth it to live here when you can find something a short distance away for less than half the price. Living in Notting Hill is definitely worth it. It is one of the most unspoiled areas of the city and you feel as if you are living in a leafy green forest. Notting hill gives such an appearance of space and tranquility amid the bustle of this large city, that if you can splash out on one of the houses here, you will have a little bit of paradise in the big city all to yourself.